Remove all unpopped kernels and place popped corn in a large bowl. Line a large baking sheet with wax paper. Lightly grease wax paper. Combine caramels, butter, and milk in a heavy 2-quart saucepan. Cook over medium heat until caramels melt, stirring until mixture is smooth. Arrange groups of three pecans in a cloverleaf pattern on the prepared baking sheet. When caramel is smooth, pour over popped corn, tossing gently to coat. Let stand 2 minutes or until mixture holds its shape when spooned onto nuts. 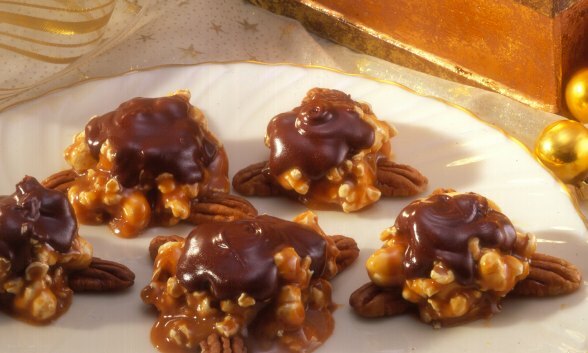 Using two spoons, place mound of caramel-coated corn onto the center of each pecan cloverleaf OR roll caramel-coated corn into a ball and place onto cloverleaf pattern. ** Combine chocolate chips with shortening in a small saucepan. Cook over low heat until chips are melted. Spoon chocolate over each caramel mound. Chill 4 hours or overnight. *Using a Presto® popcorn popper, prepare popcorn as directed in the popper’s instruction manual. **If using this method, you may want to grease your hands lightly with butter or vegetable oil before working with caramel corn mixture.